Each spring I feel like I’ve over-committed. It seemed so harmless at first. They’ll be cute, I thought. You’ll enjoy the adventure, they said. Then reality set in and I realized I just wasn’t ready. No, I don’t have children and my husband Jason and I don’t have any pets. I’m talking about coloring eggs. Several years ago I decided to take the vegetables I cook with at farm markets each week and use them to naturally dye eggs. With so many choices from the bright yellows of onions, red from beets, purple with red onion skins and bright blue of red cabbage I got carried away. They looked great set out in a basket but then I was faced with the cold reality of three dozen hard-boiled eggs. Jason took some into work for breakfast and we chopped some to toss over spinach and bacon salad at dinner but thee weekend rolled around and there were still a good two dozen facing me every time I opened the refrigerator door. The solution to my New England guilt over wasting valuable food presented itself in the form of a two-fer. I made egg salad – the obvious solution – but then dressed it, not with mayonnaise, but with Sauce Gribiche, its cooked-egg cousin flavored with cornichon and capers. Hard-cooked eggs dressed with hard-cooked eggs, served with spring greens atop crisply toasted bread was a hit for brunch and my Easter-egg dilemma was solved. However, I still don’t think we’re ready for children. The savory flavors of Sauce Gribiche – a cooked egg mayonnaise with capers and cornichon add take egg salad from the school lunchroom to a sidewalk café. Coarsely chop 5 eggs and place into a large bowl. Add chives and parsley and stir to mix. Make Sauce Gribiche: Separate 3 remaining eggs. Finely chop whites and reserve. Place yolks in a medium bowl. Add mustard and lemon juice and mash together into a wet paste. Whisk oil into egg yolk paste a few drops at a time. When the sauce thins and comes together increase the oil to drizzle until all of it is incorporated to make a creamy sauce. Fold reserved egg whites, shallot, cornichons and capers into sauce. Add sauce to chopped eggs and fresh herbs and fold together. Season with salt and pepper. 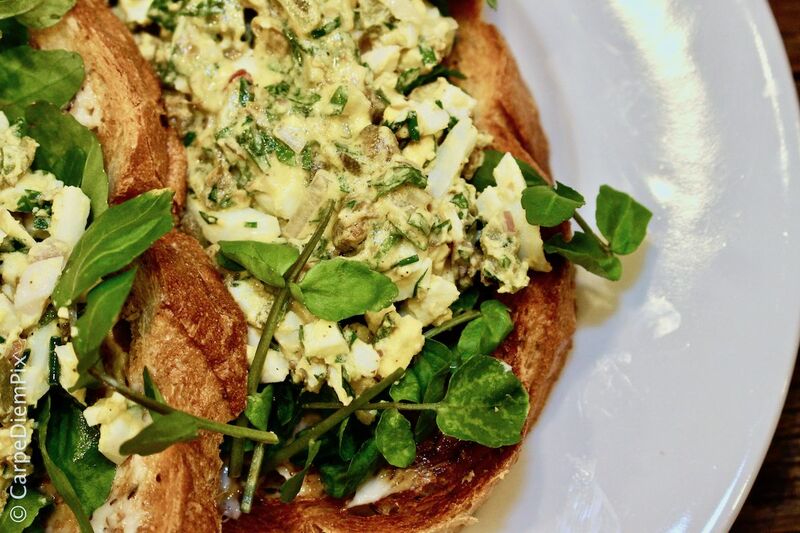 Layer each piece of toasted bread with ¼ of watercress or arugula and top with ¼ of egg salad to serve. Simple blessings: family, friends and flawless mashed potatoes!